This assessment is designed to guide States, Territories and Tribes (STTs) in building a coordinated and integrated system of care to assist families and children and youth before and after they obtain permanency. The assessment highlights components needed for the development of an adaptive and coordinated system of resources, communication, civic engagement, and advocacy for the development of a meaningful permanency support and preservation program. 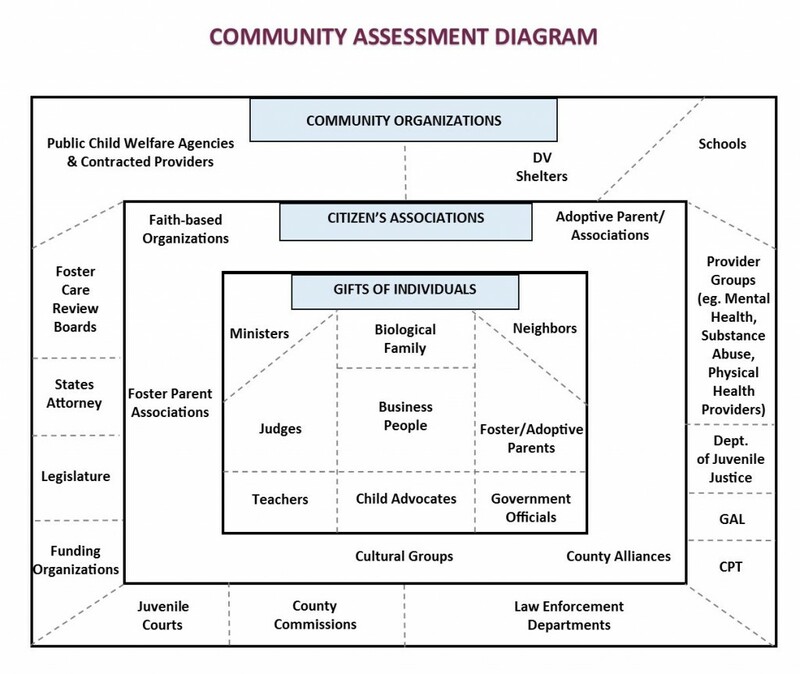 STTs can use the assessment to assess their current system and determine where they can enhance their continuum of care through increased community engagement/partnership. The assessment consists of six components: Vision and Governance, Theory of Change and Ecosystem, The Importance of a Backbone Organization, Leveraging Community Assets, Parents as Civic Entrepreneurs, and Evaluation. A description of each of these components can be found by clicking on the linked headings in blue. Click on here to bring up an electronic copy of the NRCA Assessment to Determine Form. The NRCA Readiness Assessment Toolís emphasis on systems development and change is what sets the tool apart from scaling conventional post-permanency, service-delivery programs built on government dollars. Parsons (1997) identified three types of systemsóbureaucratic, professional, and communityóthat are all intertwined in the social systems of a community. ìCurrently, the balance tilts toward a combination of the bureaucratic and professional, creating an institutional focus,î (Parsons, 1997, p. 9). Although government, as led by the authorized child welfare agency, must be a critical sponsor of such a system, the communityís stakeholders must have a systematic plan to best support adoptive families within a systems approach. Given the unique and ever-growing dynamics of post-permanency activities, the tool focuse s on shifting the balance toward a community-professional combination, grounded in the assets and desires of the community, and particularly by parents and youth themselves. So why a new approach? Why not just scale services for post-permanency activities? Perhaps the biggest reason is due to the nature of current government funding structures. Unlike title IV-E foster care, title IV-E for adoption assistance does not have a corresponding program or administrative case management functions. According to the Congressional Research Service, nearly one-third of all title IV-E spending (state and federal) supports children in permanent adoption or guardianship placements. 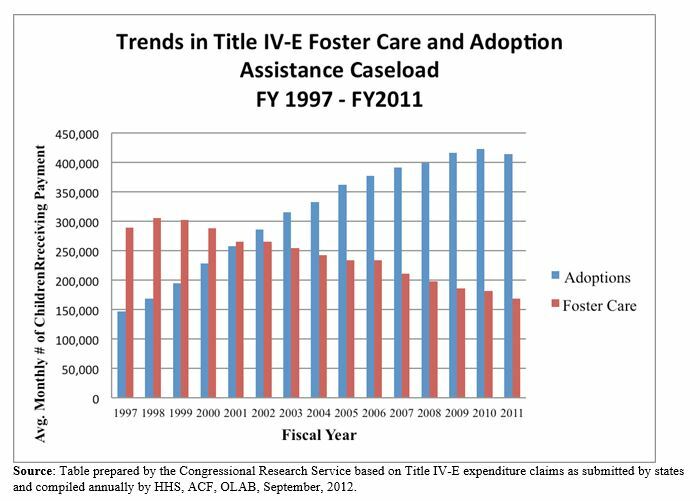 In FFY2011, more than 80% of the total spending for title IV-E adoption assistance ($4.0 billion) and title IV-E kinship guardianship assistance ($51 million) supported ongoing subsidies for eligible children (Stoltzfus, Child welfare: a detailed overview of program eligibility and funding for foster care, adoption assistance and kinship guardianship assistance under title IV-E of the social security act, 2012)). The subsidy amounts actually exceeded the maintenance portion of all foster care payments of over $2.4 million. Family Support Services are intended to help families provide safe and nurturing environments for their children. Family Preservation Services are targeted to families in crisis and include placement prevention services, post-reunification services, respite care, parenting skills training and infant safe haven programs. Time-Limited Family Reunification Services help families that are seeking to address the conditions that led to removal of a child. Adoption Promotion and Support Services help families that are preparing to adopt or that have adopted a child from foster care. Based upon the above authorization, states are required to comply with a 25% match and provide for no less than 20% of funds to be applied to each category. In the Adoption Promotion and Support Services category, there is no requirement as to the minimum or share that must be spent on post-adoption activities. In 2010, states were provided just over $341 million in PSSF funds compared to nearly $4.6 million in title IV-E payments for foster care. In 2005, the share of funds available from PSSF for Adoption Promotion and Support Services was 19 percent, or $70 million (Casey Family Programs, 2011). Essentially, federal dollars available for post-adoption support has been, at the most anytime, 1.0% of the federal share of title IV-E foster care dollars and adoption subsidy support. Solely relying on federal dollars from title IV-E or IV-B for post-adoption supports will not suffice considering the current funding requirements. A common theme among all states that participated in the focus groups was the small number of paid staff dedicated to providing specific post permanency services or supports, even in those states with dedicated contracts for post-adoption supports. One of the states that participated in the focus groups had a healthy subsidy amount and more children in adoption assistance than foster care; however, the stateís adoptions administrator was the only paid professional who provides any type of navigation or services support to parents. In this state, support groups for parents were mainly offered through the foster adoptive association, and resource development was principally provided at the time of placement. Publish materials (cooperatively with the Department) regarding adoption process, and adoption supports in North Dakota. Facilitate support groups for adoptive parents and adopted youth (cooperatively with local foster adopt recruitment/ retention coalitions). Advanced training on special needs adoption for families. Training of mental health providers on special needs adoption. Crisis intervention, primarily through phone contact with families. Referral for on-going case management services, therapeutic services, mental health services (in-home and residential care) and respite care. Facilitating a mentorship program for adoptive parents. All the services noted above would be provided to familiesí state wide, primarily through phone and other electronic means, for an estimated cost of less than $100,000 during the first year. Stephen Goldsmith, a former chair of the Corporation for National Community Services (CNCS) notes in his book, The Power of Social Innovation: How Civic Entrepreneurs Ignite Community Network for Good ñ that we clearly need new methods to provide support for families and communities on social challenges. NRCA cautions against dedicated funding for post permanency services that is overly prescriptive unless it is integrated with mental health and educational systems and leverages other multiple levels of funding for children and youth. When funds are spent just to deliver services, their impact is limited to the people who receive those services. However, when funds are also devoted to systems change, their impact can extend beyond a single service, thereby impacting the well-being of youth and stability of adoptive families on a long-term basis. Significant benefits and supports can be created without government controlling both the decision-making, coordinating, and funding of supports. As the focus group participants clearly noted, there is not one size that fits all when developing post-permanency systems that support families. The current dynamics of federal funding compounded with the growing numbers of children in subsidized assistance agreements, makes a new approach not only ideal but also a necessity. This system development must be based on ìsystems changeîóa shift in the way that a community makes decisions about policies, programs, and the allocation of its resourcesóand, ultimately, in the way it delivers services to its citizens. To undertake systems change, a community must build collaborative bridges among multiple agencies, community members, and other stakeholders (Foster-Fishman, Van Egeren, & Yang, 2005). Top-down service delivery models must be supported with bottom-up civic and parent engagement. Adoptive parents and guardians in particular have unique gifts to share, not just for their children, but also for the broader community. The best and most creative post-permanency programs are aware of these assets and provide opportunities for them to be leveraged. Making creative connections and building innovative relationships is the heart and soul for any community (Kretzmann & McKnight, 1993). This system approach recognizes components that interact with one another to function as a whole (Foster-Fishman, Van Egeren, & Yang, 2005). Shifting system components and/or their sequence. Shifting interactions between system components. Altering the ìwhole Aî through shifts in underlying choices. Shifting the manner in which the system provides feedback to itself. The development of this systems approach must be appropriately balanced among government, professional, and community components. As with most social services, greater emphasis on community development and parent engagement strategies is imperative in leveraging both formal and informal supports. These approaches must be resourced in a planned manner. Adoptive parents and guardians cannot be simply viewed as traditional consumers of services and supports. Rather, they should be seen as parents who must be engaged as leaders, identified as community connectors, and empowered to design creative solutions. Adoptive parents should be viewed as ìcivic entrepreneursîóthose who can shift the power dynamic and make real change possible on an individual and community level (Goldsmith, 2010). System development for post-permanency services must be seen through an asset-based community development approachófocusing first on the gifts of individual adoptive parents/guardians, followed by inclusion of informal associations, and finally coordination with formal institutions. Ultimately, such processes must be nurtured in a network approach that implements activities into impactful outcomes for children and families. The following post-adoption ecosystem has been adapted by the Asset Based Community Development Institute (Kretzmann & McKnight, 1993). The public-private partnership has identified and appointed a diverse group of individuals who have agreed to be members of the steering committee that helps to lead, coordinate, develop, and integrate post permanency supports and activities in a designated community. The state or county child welfare agency has been authorized to institutionalize a public-private partnership for purposes of building a broad ecosystem of post permanency policies, activities, services, and supports. The partnership will be supported by a ìsteering committeeî as the venue for planning and developing the ìtheory of changeî in a post permanency system. 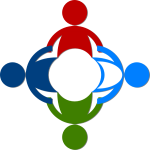 The Steering Committeeís system of care work will be supported and implemented by a Backbone Organization that will lead efforts in coordinating, planning strategies, tracking tasks, funding/fiduciary and communicating activities and developments. The Steering Committee has developed and identified ìcommunity-ledî activities and service arrays that are available at no cost or nominal fees to adoptive parents/guardians. The Steering Committee ensures that adoptive parents/guardians are engaged as civic entrepreneurs for purposes of designing policy, generating solutions, providing peer and training support, and leveraging community relationships and assets. Parents have a legitimate voice in the child welfare system, being able to provide feedback and guidance on policies and programs that directly address adoption/guardianship issues. The Steering Committee has developed a ìlogic modelî that maps inputs, activities, outputs, and short-term and long-term outcomes that are measurable over time. The Committee ensures monitoring and evaluation of outputs and outcomes including assessing impact through Return on Investment analysis. [su_spoiler title=”Bibliography”]Andrea A. Anderson, P. (n.d.). The community builder’s approach to theory of change: a practical guide to teory development. New York: The Aspen Institute Roundtable on Community Change. Cabinet Office of the Third Sector. (2009). Social return on investment – for social investing: how investors can use SROI to achieve better results. Cabinet Office of the Third Sector . Campos, M., Gowdy, H., Hildebrand, A., & LaPiana, D. (2009). Convergence: how five trends will reshape the social sector. San Francisco: The James Irvine Foundation. Foster-Fishman, P., Van Egeren, L., & Yang, H. (2005). Using a systems change approach to evaluate comprehensive community change initaitves. Toronto, Canada: W.K. Kellogg Foundation. Goldsmith, S. (2010). The power of social innovatoin: how civic entrepreneurs ignite community networks for good. San Francisco, CA: Jossey-Bass. Kretzmann, J., & McKnight, J. (1993). Building communities from the inside out: a path toward finding and mobilizing a community’s assets. Evanston: Asset-Based Community Development Institute. Martin, E., Kania, J., Merchant, K., & Turner, S. (2012). Understanding the value of backbone organizations in collective impact. Stanford Social Innovation Review. Osborne, D., & Gaebler, T. (1992). Reinventing government: how the entrepreneurial spirit is transforming the public sector. New York City: Penguin Group. Parsons, B. (1997). Using a systems change approach to building communities. Boulder: InSites. Smith, S. (2010). Keeping the promise: the critical need for post-adoption services to enable children and families to succeed. Policy & Practice Perspective, Evan B. Donaldson Adoption Institute. Stoltzfus, E. (2007). The promoting safe and stable families program: reauthorization in the 109th Congress. Washington, DC: Congressional Research Service. Stoltzfus, E. (2012). Child welfare: a detailed overview of program eligibility and funding for foster care, adoption assistance and kinship guardianship assistance under title IV-E of the social security act. Washington, DC: Congressional Research Services.